Is there a “conventional” configuration for mounted accessories? Many different types of bike accessories as designed to be mounted via somewhat-conventionalized braze-ons: These braze-ons most often are on the down tube and occasionally on the seat tube and nearly always seem to be mounted with two screws 8cm apart. However, is there not some sort of accepted convention for the "best" places to put different types of accessories? For example, water bottles are more easily reached while biking if they're on the down tube rather than on the seat tube, so if there's only one water bottle cage, I'm guessing most people would mount it on the down tube. However, what about other stuff?-- Locks, pumps, bananas and so forth? hanging it underneath the top tube near the saddle seems like a good place, but then it's not possible to shoulder the bike --- something I have to do regularly since I ride the bike daily in an urban environment (albeit without stuff like water bottles and air pumps on it). mounting it on top of the top tube isn't possible because that's where the rear brake cable runs: The above-mentioned custom holder thing doesn't work there, and I can't simply use the lock holder's Velcro straps by themselves because I'm sure some wiseguy will steal the holder. However, is the lock's positioning really so "strange"?-- its weight being so high and forward doesn't actually seem to affect handling nearly as much as I'd feared, which is the main reason I thought that people tend to mount stuff "low" and "back". I can't find a place on which to mount a proper holder for it. the saddle bag featured in the photo of the previous bike doesn't actually fit on the newer bike's saddle. 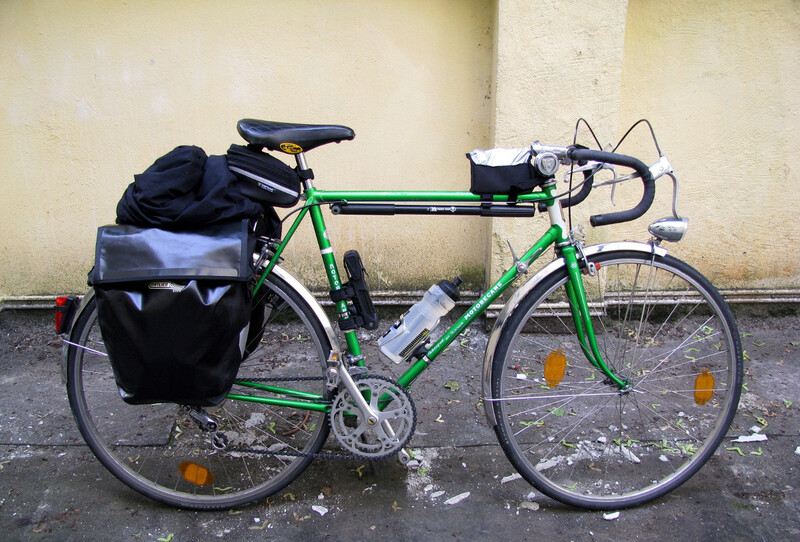 In conclusion, the way I configured my bike's equipment was partially based on what I saw other bikes look like (e.g. with the bottle cage) and partially based on the quirks of my bike itself, which enforced constraints on where I "thought" accessories were supposed to go. Is this in fact what everyone does, and the second factor is what contributes to the variations in different riders' setups? Certainly, at least my "common sense" when it came to placing weight low and to the rear was actually a bit nonsensical. Answer: As with everything in cycling, it depends. You need to put stuff where it suits you, and your bike. Weight aft helps on descents but the rear wheel already more than half the weight of the bike. Carrying something you don't ever need? Leave it at home, that helps all the time. Items you need to access while riding have to be somewhere you can get to without stopping. You're unlikely to need your lock, pump or spare tube while riding, but you absolutely will need your water and food. You don't want to upset the aerodynamics by having stuff poke out, or the brakes/gears by interfering with cables. And you don't want the load to impact your body position or to poke you while riding. As in your pictures, front fork panniers and rear panniers do a good job of sharing the load over both wheels. Specific to your bike - you could mount the lock opposite the down tube bottle because its low, and you don't need it while riding. It is an exposed position, but you have full front mudguards/fenders to help. Also an increased risk of the lock falling off unnoticed. Personally my bike has nowhere to mount a frame pump, so I velcro-tie mine onto the top tube. For commuting with panniers and/or a toddler seat, I've settled on the front fork for the D-lock, mainly because little else fits there and I'm restricted by cables and tube diameters elsewhere. Having that 1.5kg forwards also helps the handling with a heavy back load. Don't forget that a heavy lock is only around 2% of a rider's weight - it has to be a long way from the centre of mass to be noticeable for handling. 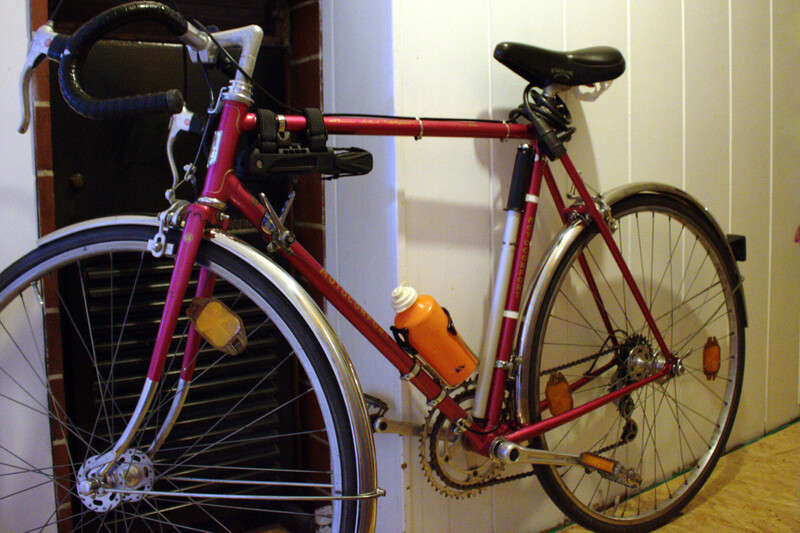 A cable lock will often fit in a spare bottle holder. I actually use the down tube holder for this, and the seat tube one for my bottle. But I'm usually in stop-start conditions (for longer rides I use both bottle holders for bottles). My pump actually fits under the down tube with around 10mm clearance to the mudguard. My puncture kit (including for humans) and other tools go in a small triangular bag in the front of the frame. A saddle bag doesn't fit with the toddler seat. I'm lucky in that I normally lock up somewhere I'm happy to leave tools and lights on the bike. As for convention, if there is one I ignore it. Personal preference combined with quirks of bike design are much more important. Not the answer you're looking for? Browse other questions tagged accessories bike-setup braze-on or ask your own question. How should I restore braze-on brake cable housing guides? Possible to repair a pushed in braze-on? Would a seat post mounted back rack act like a rear fender?